One of my favorite cards in the game. This plus reno = best way to concede. All HS cards are real (or possible) things in wow. Hands down one of the most interesting cards in the Classic set, if not really the most interesting. The one card that keeps Priest even semi-viable right now. Come on Blizzard! Give us some more good priest cards! You asked for it, and it happened. Thanks horrible blizzard balancing! That card art is awesome. More this and less Kill Commands. Unfortunately, that requires a very specific combo of cards, and it's your own fault if you're not baiting/counterplaying out their poster combo. Also, "play way better" does not equate to "has better draws." Had this on the board and played Reno Jackson with no more than 1 of each card in my deck. The result: instant death. At least you got rich. Not... quite what was planned. Hope this and Spawn of Shadows will make shadow priest a thing. If you play this card with Circle of Healing, and you have Spell Damage +1, does it deal 5 damage instead of 4? 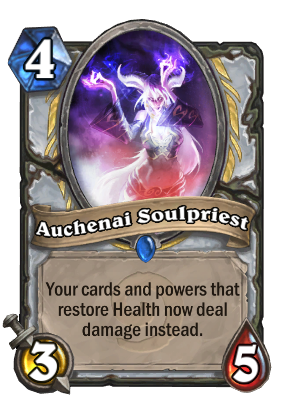 Yes, COC (and all healing spells) is affected by +spell damage with Soulpriest on the board. How good is tree of life n' zombie chow! Why would you have a Priest deck without this?